The Persistence Market Research report on the global native starch market analyses the opportunities in the market, and presents updates and insights pertaining to various segments of the global native starch market over the forecast period 2018–2026. The report begins with sizing the base year in terms of value and volume through the determination of how much native starch is being consumed. For better understanding and clarity, the production of raw materials such as potatoes, tapioca, corn, and wheat is tracked through the United States Food and Agriculture Organization. The market scenario through various sources such as corn, wheat, potatoes, and tapioca is tracked through analyzing processed products or derivatives derived from these products, which are further amplified for benchmarking the data for the native starch market. This forms the basis for forecasting how the native starch market is anticipated to take shape in the near future. Given the characteristics of the native starch market, Persistence Market Research triangulates the data via different analysis based on supply side, demand side, and dynamics of the global native starch market. To develop the market forecast, Persistence Market Research conducted factor analysis to understand the impact of various forces/factors on the global native starch market. However, quantifying the native starch market across the above mentioned segments is more a matter of quantifying expectations and identifying opportunities, rather than rationalizing them after the forecast has been completed. To understand key segments in terms of their growth and performance in the global native starch market, Persistence Market Research has developed a market attractiveness index. The resulting index should help providers identify existing native starch market opportunities in the global native starch market. Persistence Market Research offers an eight-year forecast for the global native starch market between 2018 and 2026. In a recently released report by the company, the global native starch market is expected to register a CAGR of 5.2% during the forecast period. The primary objective of the report is to offer insights on the advancements and opportunities in the native starch market. The study demonstrates the market dynamics that are expected to influence the current challenges and future status of the global native starch market over the forecast period. This report also offers updates on the trends, drivers, restraints, value forecasts, and opportunities for manufacturers operating in the global and regional native starch markets. The scope of our study for native starch includes commercial as well as domestic native starch available in the market. The global native starch market, by source, is segmented as corn, wheat, potatoes, tapioca, and others. The corn segment is anticipated to grow at the highest CAGR in the global native starch market over the forecast period, owing to the rising demand for organic products, especially in the North American and European regions. Consumers across the globe are demanding food and beverages with natural ingredients, which is expected to push revenue generation of the native starch market in the near future. The global native starch market, by form, is segmented into powder and liquid. The powder segment is expected to grow at a faster rate over the forecast period, due to various reasons such as convenience in storage, transportation, and longer shelf life. Moreover, the powder form can be easily mixed with any kind of mixture, and works more effectively. The global native starch market, by form, is segmented into the food and beverages industry, paper industry, feed industry, and others. The food and beverages segment is further segmented into dairy products, bakery, soups & sauces, infant formula, convenience foods, snacks & confectionary, beverages, and others. The dairy products and bakery segments are expected to witness higher growth rates, owing to the increased application of native starch in these segments. The report includes market share of each segment according to the region, with analysis towards market trends, respectively. By region, the global native starch market is segmented into North America, Latin America, Europe, Asia Pacific, and Middle East & Africa. A section of the report highlights the global demand for native starch. This study discusses key trends contributing to the growth of the global native starch market, as well as analyses the degree at which the drivers are influencing the global market. In the final section of the report, a competitive landscape has been included to provide report audiences with a dashboard view. Key categories of providers covered in the report are global native starch key players. Detailed profiles of the providers are also included in the scope of the report to evaluate their long-term and short-term strategies, key offerings, and recent developments in the global native starch space. 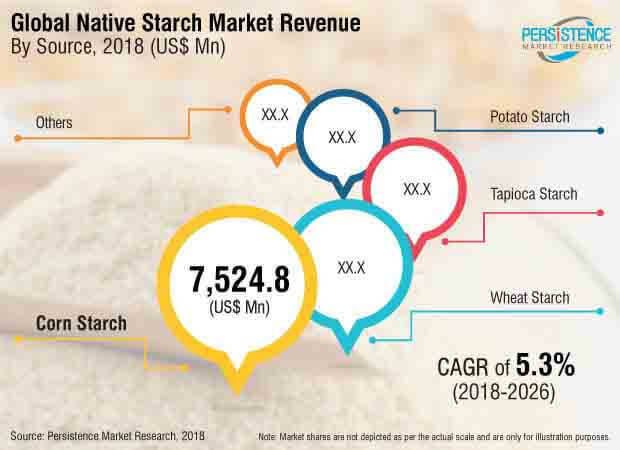 Key players in the global native starch market include Ingredion Inc., Cargill, Inc., E. I. du Pont de Nemours, Tate & Lyle PLC, Archer Daniels Midland Company, Roquette Frères S.A., Euroduna Food Ingredients GmbH, BENEO GmbH, Kent Corporation, MGP Ingredients, Inc., AGRANA – Beteiligungs AG, Tereos Starch & Sweeteners Iberia Sa, Thai Flour Co., Ltd., Manildra Group, Avebe U.A, Amylco LLC, KMC Kartoffelmelcentralen A.M.B.A, Gulshan Polyols Ltd., and SPAC STARCH PRODUCTS (INDIA) LTD., among other native starch manufacturers. In addition, it is imperative to note that, in an ever-fluctuating global economy, we not only conduct forecasts in terms of CAGR but also analyse on the basis of key parameters, such as year-on-year (Y-o-Y) growth, to understand the predictability of the market and to identify the right opportunities.